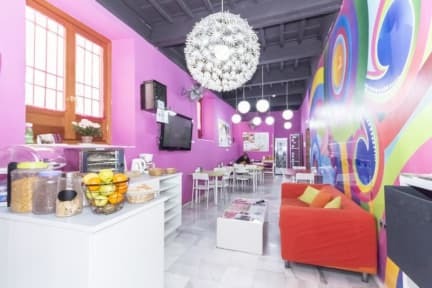 White Nest Hostel - Granada is in a very central location, perfect for exploring Granada on foot. It's in the Albayzín, just five minutes from Gran Via and in an area with great views of the Alhambra. It's also surrounded by cafés and shops. This hostel features charming rooms with hot showers and comfy beds as well as a cool, relaxing courtyard terrace. There's also a chilled-out lounge, perfect for meeting your fellow travellers and the friendly staff. Here you will easily meet soooo many cool people from all over the world. Everyone in White nest, guests and staff alike are friendly & fun. This is a very fun place, with a great atmosphere! White Nest is very clean, spacious, funky and a pretty place. It has a nice common area, free walking tour every day 11.00AM and many more activities. 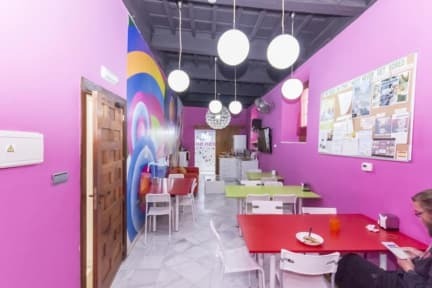 We are located in the Albaicin, the old part of the city, with so much nearby, especially the Alhambra, also close to the cheap shopping areas, tapas bars and 200 meters from an awesome Flamenco bar! The spacious dorms are clean, smells fragrant, and are very pleasant. All our rooms are equipped with marble tiles and underfloor heating system. Our great showers and comfy beds help you to feel like your at home! The kitchen is always clean, free tea, coffee, olive oil, and salt is always a bonus, don't you think? You really feel like a flash-packer when you stay here! The building is lovely traditional XVII Century Andalusian Palace- Security is also good because we know this is important for you. Breakfast is not included but we do have complementary tea, coffee and biscuits plus cereals. We are also 10 meters distance from a traditional tapas bar were you can have cheap and tasty breakfast from 3. We speak English, Spanish, French and Italian so we are able and happy to provide you all the necessary information you will need to make your stay in Granada unbelievable. We offer accommodation in private and shared dorms, bathrooms located on every floor, hot water available 24 hours. IMPORTANT INFORMATION: we will proceed to check that your Credit Card is valid to guarantee your reservation. If it's not valid, it must provide a valid one in the next 24 hours. Otherwise, the hostel will proceed to cancel your reservation. Had the best time here! Location couldnt be better, great brekky, comfortable beds, amazing staff. Met some great people here too.The value is incredible. Great location, very helpfull staff! My stay at white nest was great! The staff was extremely helpful and friendly and literally went out of their way for me. The location is perfect. I would absolutely stay here again if I come back to Granada! Great location and easy to find. The staff was very kind and helpful and me and my friends loved staying here! Was only here for one night but this place seemed nice and I got a very good night sleep in the 8 bed dorm. Good location also, would return. Staff were nice, super dark room I had, they seem to always have the lights off, my room had a gal who kept coughing and another one w bad body odor lol , when the window was open it would get smoke smell from the smokers below. Private bathroom which is nice but only one bathroom on the floor for many guests. Super colorful place. We were happy with you . Good located and cheap hostel. But their beds aren’t that comfortable at all. Breakfast is available for 4€ but I would rather suggest to go to a cafe and get a nice one. I think what makes us special is our colourful patios and the fact that we're the closest to the Alhambra and the tapas zone. This is a historical building in a fantastic location in the heart of the Albayzín, 30 minutes walk to the Alhambra and 10 minutes walk to the city centre. I really recommend that guests explore this neighbourhood on foot, as well as the Realejo neighbourhood - it's got wonderful graffiti. I think our staff are really friendly and are great at adapting themselves to our guests' wishes. We cater for people with disabilities, with ramps and adapted bedrooms.